The Title "The Circus of Words Acrobatic Anagrams, Parading Palindromes, Wonderful Words on a Wire, and More Lively Letter Play" is written by Richard Lederer . This book was published in the year 2001. The ISBN number 1556523807|9781556523809 is assigned to the Paperback version of this title. This book has total of pp. 144 (Pages). The publisher of this title is Chicago Review Press, Incorporated. We have about 2058 other great books from this publisher. 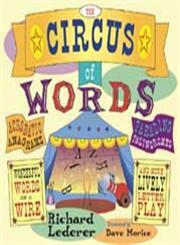 The Circus of Words Acrobatic Anagrams, Parading Palindromes, Wonderful Words on a Wire, and More Lively Letter Play is currently Available with us.